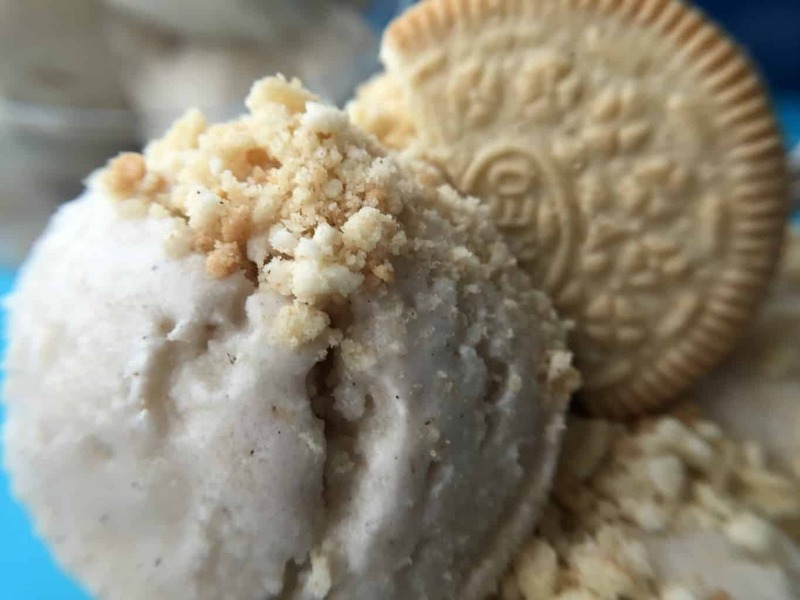 Really good vegan ice cream can be hard to find. Apparently. I didn’t think this was so, but then I’m not the most fussy sort when it comes to ice cream. 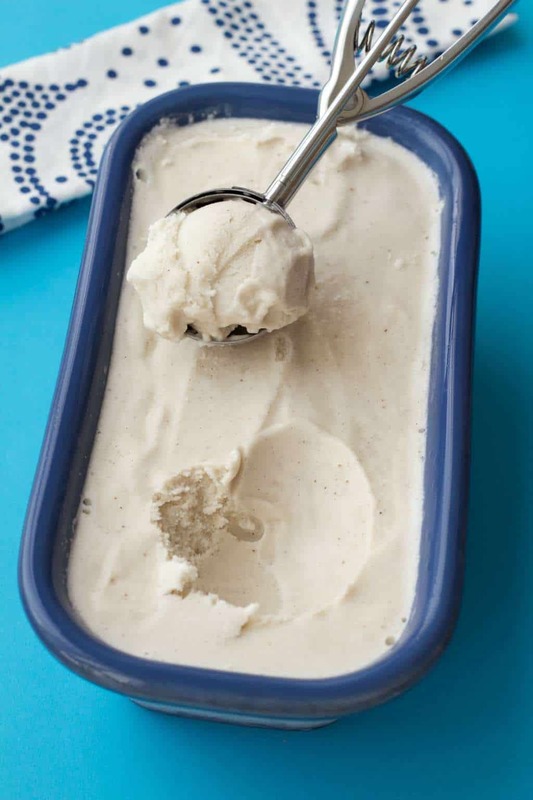 I’m one of those who thinks frozen bananas processed in the food processor until creamy is super delish (and I’m not wrong, check out this 2-ingredient peanut butter banana ice cream). And when I found some rice milk ice cream at the organic store I was delighted and thought it was fab, that is, until my sister had some and declared it tasted like sorbet. And she didn’t mean this in a complimentary way. So I set out to make a vegan vanilla ice cream that would taste every bit as amazing as the creamiest of creamy ice creams in the world! And so the experiment began. The first batch I made I just blended the ingredients together, and then churned them up in the ice cream maker. Hmmm. Not bad, but the texture just wasn’t right. And my inquiring mind was wondering – should I heat the mix up first? If so WHY? Why do some recipes heat up the ingredients first? So I researched online and came across a great article explaining the why of it all. Why you should heat up the ingredients first (you want to homogenize the fats so they don’t create a grainy texture). 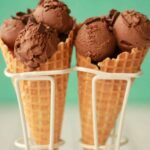 And why so many vegan ice creams can end up tasting like sorbet (they use plant milks that are not fatty enough – rice milk or soy milks just don’t have enough fat). So using a mix of canned coconut milk (full fat version) and canned coconut cream is the best solution. So I tried again – and this time I also used some coconut oil in the batch. This was pretty good but there was a slight fatty aftertaste that I didn’t love. So I tried it again – without any coconut oil, and bingo – nailed it. 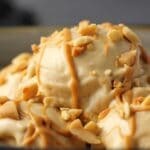 Making this vegan vanilla ice cream is really straightforward. You heat your ingredients to a simmer, and then blend for 30 seconds, this removes all graininess from your mix. Then you let the mixture cool down (ideally overnight in the refrigerator, but in a push you can cool it for a couple of hours in the freezer), then churn it in the ice cream maker until it reaches soft serve consistency. Then you transfer it to a loaf pan, cover with foil and allow it to set in the freezer. 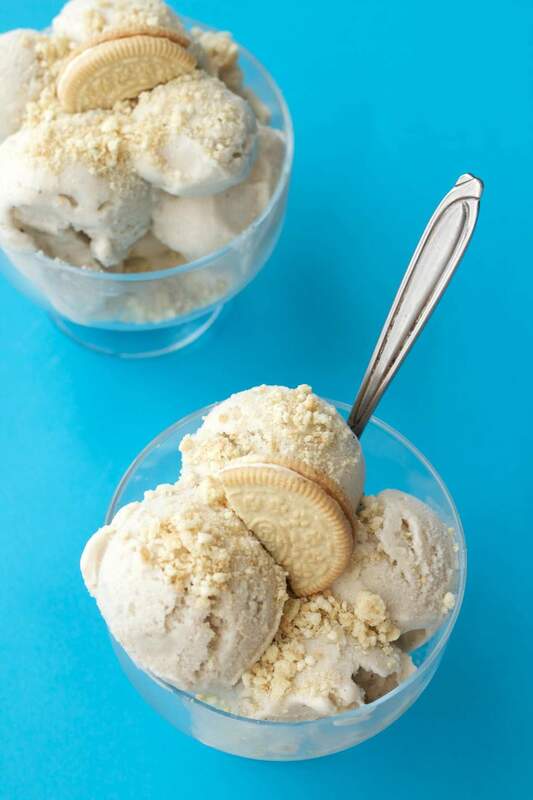 This vegan vanilla ice cream is smooth and rich with melt-in-the-mouth creaminess and has a perfect ice cream mouthfeel. You will not be calling this a sorbet that’s for sure! And what I love is that you can take this basic recipe and flavor it all different kinds of ways. Instead of adding vanilla flavor you could add cocoa for chocolate flavor, you can add nuts or chocolate chips or anything you like! I decided to go with some Golden Oreos for sprinkles, as they’re basically vanilla flavored, so it works well to pair these together. But this is of course completely optional. If you prefer it plain or don’t like oreos, leave them out. This ice cream is most delicious eaten fresh, within a few days, though of course it keeps in the freezer – it’s ice cream after all. 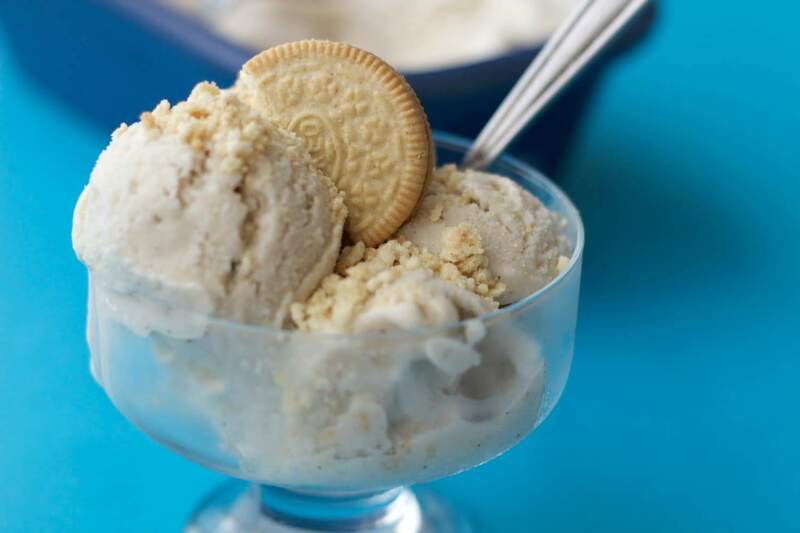 But even with the most creamy smooth ice cream, if it sits in the freezer too long, some ice crystals can enter the mix and that makes it not quite as delicious as time goes on. 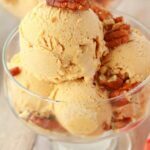 You will love this vegan vanilla ice cream! Enjoy it plain or with oreo sprinkles or nuts or a drizzle of vegan caramel sauce. It’s also totally divine to serve this vegan vanilla ice cream with some vegan apple cake or with a slice of vegan apple crisp! 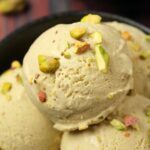 How about some more delicious vegan ice cream recipes? Leave a comment below if you have any questions about this recipe and please rate the recipe too, it’s super helpful. Thanks. Sign up to our email list before you go, you’ll get an awesome (and free!) recipe ebook containing 10 delicious vegan dinner recipes and you’ll be the first to know when new recipes are posted to the blog. 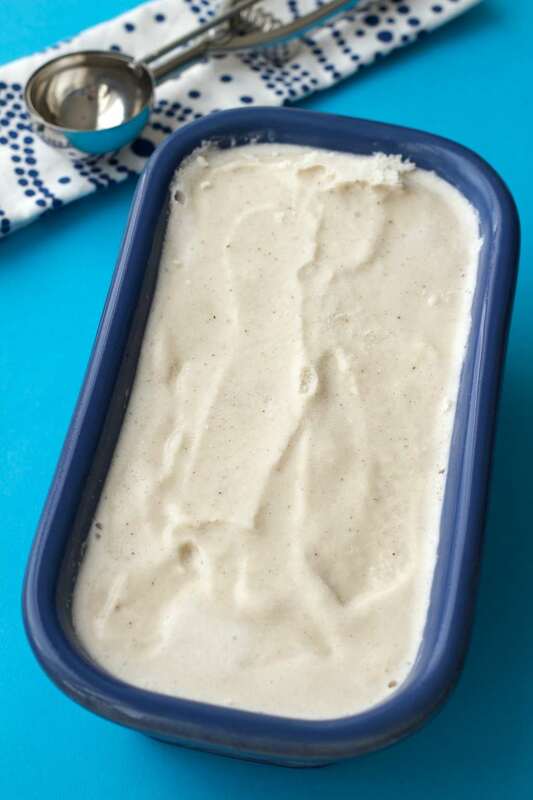 Ultra creamy vegan vanilla ice cream. 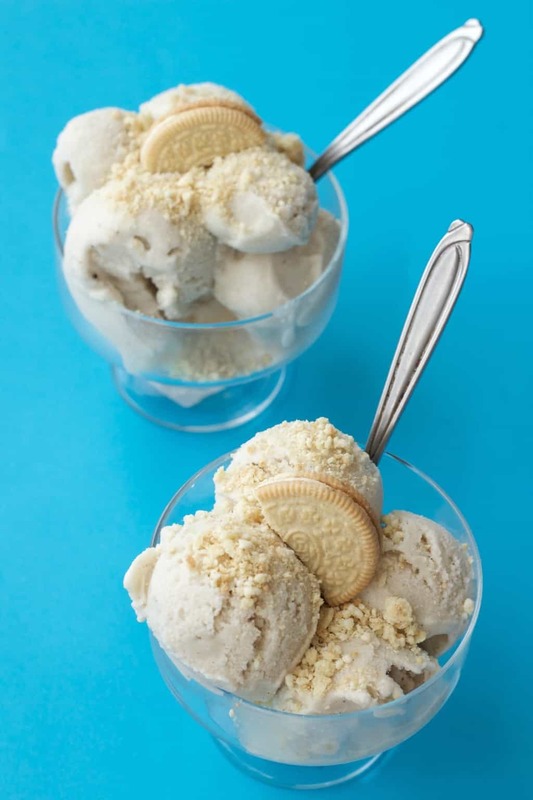 So easy to make with the most perfectly smooth, rich, melt-in-the-mouth ice cream texture. 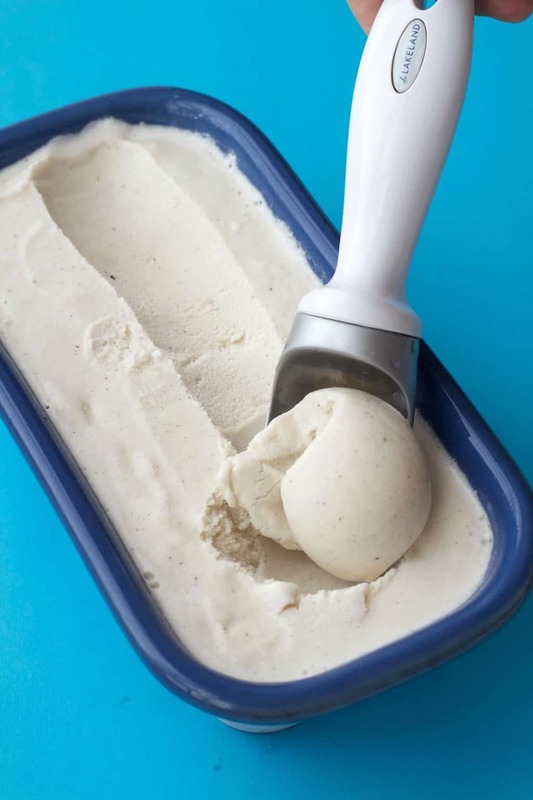 The day before, place the freezer bowl of your ice cream maker into the freezer to freeze properly. Next, place all the ingredients (except for the vanilla) into a pot and bring to a simmer – stirring all the while. As soon as it reaches a simmer, remove from heat, add the vanilla extract and vanilla powder and using an immersion (handheld) blender, blend for 30 seconds. You can also transfer to a blender jug and blend it in that – just ensure the lid is on very firmly. Pour the mixture into a container, cover and chill in the refrigerator overnight. The next day, pour the chilled mixture into your ice cream maker and churn as per the ice cream makers instructions. Can be 20-40 minutes. When it reaches soft serve consistency, move to a loaf pan or other freezer safe container, smooth down with a spoon, cover and place into the freezer for a few hours to set. When you’re ready to serve, place Oreo cookies into the food processor (around 2 cookies per person) and process into a fine crumble. Sprinkle this over the ice cream and top with half a cookie. Will keep in the freezer but best when fresh. Scoop with a hot scoop (dipped in hot water) to allow for easier serving. *Vanilla powder is totally optional here, I used it to create extra vanilla flavor, but if you don’t have it on hand you can easily omit this. *Nutrition estimate is for a 1/2 cup serving without Oreo sprinkles. *Prep time does not include chilling the mixture or time spent setting in the freezer. 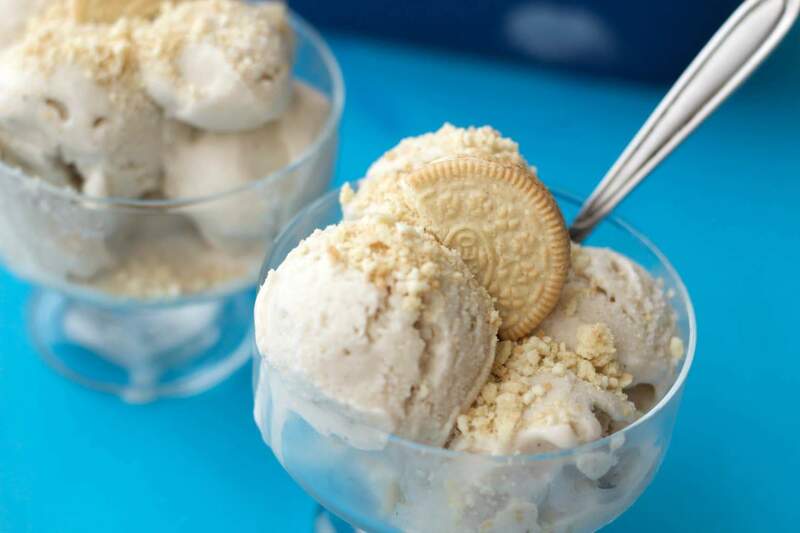 Peanut Butter Banana Ice Cream – 2 Ingredients! 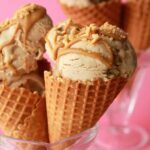 Vegan Peanut Butter Ice Cream (Ultra Creamy)! Heating it must be the key to a creamy consistency. I’ve been playing with frozen desserts, too. There is nothing in the stores that I particularly like. So far, bananas, dutch chocolate, coconut milk, and Califa Almond/Coconut has been acceptable. I hate to admit that I often add ‘processed coffee creamer’ to a simple chocolate iced dessert. Peppermint Mocha…yes, it is processed but it is one of my simple pleasures. I will try your recipe next. Also, I’ve been considering adding frozen dark bing cherries to the chocolate and a touch of almond flavoring. Hi! Yes, I think heating it is the nb part. 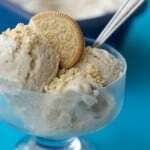 Though I have noticed that when recipes use cashews in the basic ice cream, they don’t have to heat it. This is something I’m going to experiment on next. 🙂 Mmmm cherries and almond flavor with chocolate sounds divine! This looks amazing! What if I don’t have vanilla powder??? You could just stick with vanilla extract in that case. It will still be perfect. I’d like to try this recipe, but not sure what golden syrup is and where vanilla powder can be found. Hi Christine, I updated the recipe card with some links to the vanilla powder and the golden syrup. You can definitely switch out the golden syrup for maple syrup or some other syrup though if you prefer. All the best! I really enjoy reading all your recipes and have tried a couple with success. I’ve just been going through all your ice cream recipes and can’t wait to run out and get the ingredients to get started. The trouble is I already know here in the 5 supermarkets I have access to that they sell only canned coconut milk, not coconut cream. Is there any successful alternative? I’ve read scraping out the solid part from a can of coconut milk would be the same but I wanted to run this by you first. Thanks. Hi Tonks, it should work just perfectly if you let the coconut milk separate in the fridge and then just use the cream section at the top from about 2 cans (to equal 1 can of coconut cream). 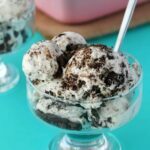 This recipe would likely work fine with just 2 cans of full fat coconut milk and no coconut cream, but it would be slightly less rich and the richer the better when it’s ice cream! So I think your idea for just using the cream part of the coconut milk can will really work great. Hi, I would really love to try this but don’t have ice cream maker. What would I do at the churning stage? Thanks. Your blog is great!!!! Hi Elie, you can try whipping it with a stand mixer. And then letting it freeze for a little bit until just before set and then bring it out and whip it again. This incorporates air which is similar to what happens when it churns. You can get a pretty great texture doing this. 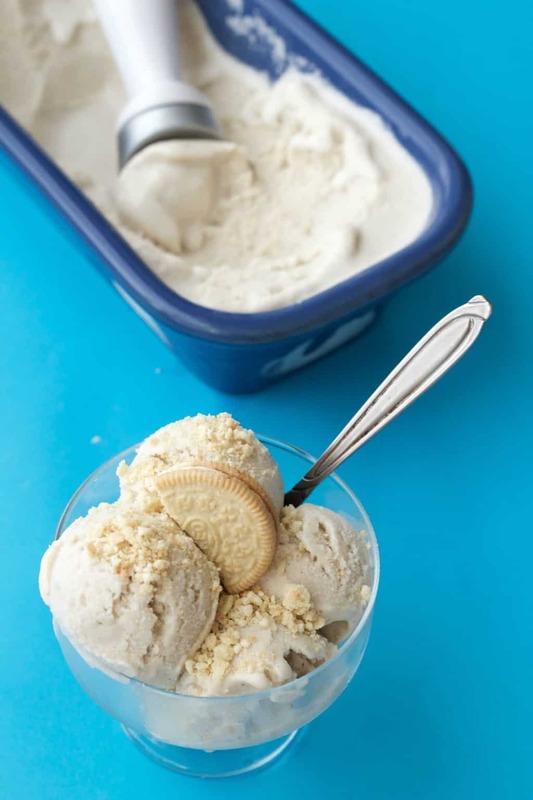 Even if you skip the churning/whipping part altogether, it will still be nice, it just won’t have that light and fluffy texture that is great for ice cream.